Our range of products include drawell box drbx with 84mm rcb, drawell box drbx with 135mm rcb and gallery rail, drawell box drbx 199mm rcb and gallery rail, drawell box drbx 199mm rcb side glass panel and drawell box drbx 199mm side glass and dividing panel. We offer Drawell Box DRBX With 84 cm RCB to our clients. Easy, quick installation and precise alignment. 100000 life cycle test certified. Silent and ultra smooth soft closing runner. We offer Drawell Box DRBX with 135mm RCB and Gallery Rail to our clients. 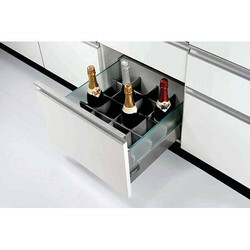 Modern Design with larger internal drawer space and compatible drilling. Gallery rail available in Square Shape and matching finish of DRBX. 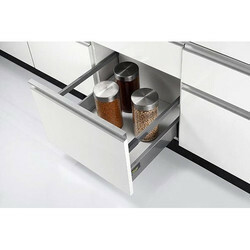 We offer Drawell Box DRBX 199mm RCB and Gallery Rail to our clients. Galery rail available in Square shpae and matching finish of DRBX. We offer Drawell Box DRBX 199mm RCB Side Glass Panel to our clients. 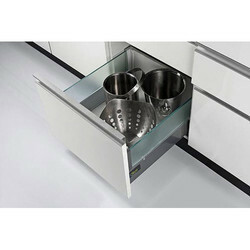 Side Glass Panel Enhance the Beauty of Drawell Box in Kitchen. Connectors for Side Glass Panel is available in Standard Size and Its Suitable for Kind of Glass. We offer Drawell Box DRBX 199mm Side Glass and Dividing Panel to our clients. 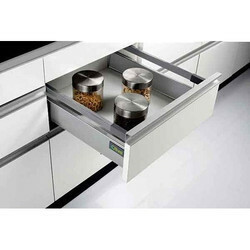 Flexible and Multi-Function dividing Panel System Gives you a well-organized Kitchen. Horizontal Dividing Panel available in 1000mm Length. Vertical Dividing Panel available in standard size and Shape.